I love potlucks, yep! There I said it. I love potlucks! There is always so much variety. Everyone pulls out their family recipes, or another dish that they are proud of. Some dishes have been in families for generations, some come with their own story. Where else can you go to share food like this with others? Whether you live in a small community or a large one, potlucks are a wonderful way to bring people together. They can be based on a theme, season or even a holiday. Many times they are a celebration of the end of something, for example if you are in a book club you may have just finished a book, on a trail crew, just finished a new section or cleaned out an old area. 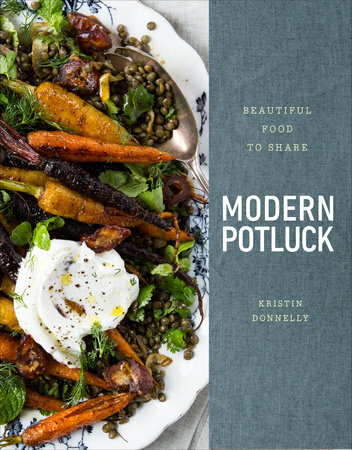 So I jumped with joy when I had to opportunity of add “Modern Potluck”, Beautiful Food to Share, by Kristin Donnelly to my cookbook collection. Kristin started her career as an editor for Food & Wine and currently is a food writer and recipe tester and developer. In this beautifully arranged cookbook the recipes are grouped into sections for snacks, dips, drinks, main dishes, etc. Also there are a wide variety of dairy-free, gluten-free and vegetarian recipes. Kristin writes that "Modern Potluck" was written to give people an updated version of a potluck. Nowadays there are, “dietary restrictions and Instagram worthiness”. The book also has other helpful information regarding rules of the Potluck and food safety. I prepared the Plum-Ginger Coffee Cake with coconut flakes. My husband who is not a big fan of sweets surprised me by saying this was the best sour cream based cake that he has ever had. Wow! I also loved all the flavor from the streusel topping of flaked coconut and candied ginger. The cake itself was moist and full of flavor. I will be making this recipe again and again, maybe next time with peaches and cardamom. Next up I will be preparing the meal featured on the cover of her book, Spiced-Roasted carrots. Even if you are not a big fan of potlucks I would definitely recommend Modern Potluck, the recipes are perfect for any type of entertaining and many of the classics have been updated to reflect our current eating habits. I received this book from "Blogging for Books" in exchange for my honest review. I love potlucks as well. We have at least 2 a year on my block, all the neighbors getting together and bringing a dish. The cookbook sounds great and that cover photo is amazing, makes me want to immediately make it. The cake you made is beautiful, I just love coffee cake. Thanks Suzanne! How wonderful you and your neighbors get together like that. Food is such a nice way to meet others and connect. Cheri, this looks sensational, I love the book concept too! Thanks for sharing! Thanks for stopping by Peggy!! hope you are having a great week-end. Hi Theresa, never fear bring something already made, it's okay. Take care! The cake looks so delicious. I love coffee cake. The book sounds great too! Thanks Kushi, coffee cake is a treat I like very much as well. I will Tandy, will make a peach and cardamom version. Thanks! The cake looks fantastic. Plum and coconut seem perfect together in this wonderful coffee cake. Thanks Angie, we are not big coconut eater either but we loved this! I like potlucks too, Cheri! What a fun cookbook! Thanks Barbara, funny I did not like them until we I really understood them. They are the best! Aww what a fun post! It makes me want to go to a family potluck! I miss those days and it seems we are getting away from community gatherings. That is something we should bring back. The cookbook sounds wonderful and so does your cake! I read something about a grange, there is one here in Oregon outside a small town, this is where the community met a hundred of years ago to band together, many potlucks were held here. I just love this kind of info. Sounds like a fun book. And I so like the new look of the blog! Thanks Amalia! appreciate the feedback. I have so many control issues that it has taken me years to relax and enjoy a potluck. This book could help a lot! Thanks for the intro! As a former College Administrator, I participated in Diversity Training. During a round table discussion, we were to give examples on how to celebrate Diversity. I stated, "What better way to recognize and explore differences in culture, community and faith then to organize a Potluck Event". Time to call up some old friends! So true, the more diverse the better;) Thanks for stopping by. I love potlucks, too, and always come away with lots of new recipes. 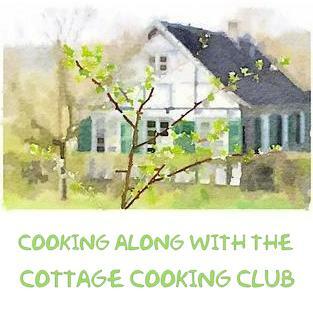 This sounds like a fabulous cookbook! Thanks Liz, yes, this is a wonderful cookbook. That coffee cake is on the schedule...yum! Coffee cakes are my favorite breakfast treats, thanks Sue! This sounds like an awesome book, I'll have to keep an eye out for it! Modern Potluck is a wonderful book, thanks Sara! It's nice that the author considers the allergy sensitive in her potluck cookbook. Potlucks generally cover a diverse array of tastes and needs, yes? Speaking of which I might say that sour cream coffee cake is about the best looking one I've ever seen - and wish I'd tasted! I agree Kim, I think that most people nowadays knows someone or has some tyoe of food allergies themselves. We are just starting to get peaches here, the good ones. Thinking about baking a peach and cardamom version. Thanks Dena! What a lovely looking book, the cake sounds delicious! Thanks Caroline, the topping was delicious and the cake was moist. We really loved this one. This book sure sounds and looks awesome...I love the idea of emphasizing potlucks...and the cake looks so good! Thanks Juliana, the cake was delicious! take care! Potluck are so much fun. It takes the pressure off the host. Looks like a fun cookbook. The cake looks so delicious. A moist cake is one of my favorites...thanks for sharing this lovely post at DI&DI. 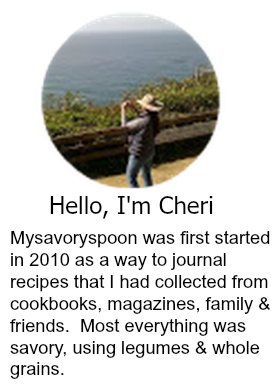 I love potlucks, too, Cheri! This looks like a great cookbook. I am curious to see how she updates the recipes. The coffeecake looks wonderful! Such interesting flavors, and anything with streusal sounds good to me. I bet the coconut on top really is great added to the streusal. Thanks for sharing your review! I'm a fan of potlucks, too! There is so much community-building potential in sharing food that everyone's had a hand in making. A dinner party is an event, curated by its host and is lovely in its own way, but a potluck is a gathering. That book is on my list to check out!